This is the last winning song of the Eurovision Song Contest to be released on 7" vinyl single. Subsequent winners (1995 and later) were only released on cd-single. That's a great loss. But perhaps it's fitting: this song was a lament for the singers' lost youths, like many vinyl buyers these days buy singles for nostalgic reasons. 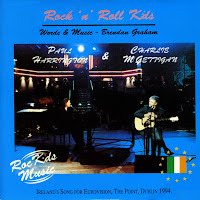 The duo Paul Harrington & Charlie McGettigan were - so it was presumed - specifically selected by Ireland not to win the Contest. As the Contest rules require the previous year's winner to host the next edition of the Contest, the argument runs that the Irish broadcaster was not prepared to do this. The setup didn't work: in an unlikely turn of events, Ireland won the 1994 Eurovision Song Contest, and still had to organise the 1995 edition.